If you’re using Ubuntu Linux or perhaps a derivative like Kubuntu or Ubuntu MATE, then you might receive a dialog message that reads “The volume “boot” has only 0 bytes disk space remaining.” When Ubuntu, Lubuntu, Xubuntu or any other derivative attempts to update, it tries to install new kernel data to the boot area. This error is warning you that you don’t have any more room. Under the Linux Filesystem Hierarchy Standard, most of the boot loader files including the initrd and the kernels live in the top-level /boot directory, which is directly under the root directory. Most users of Linux on a home basis won’t have this on a separate partition. They’ll have one big /dev/sda1 or /dev/sda2 partition for Linux and this is one directory on there. If this is your situation, then you’ll more than likely never see a “volume boot has only 0 bytes remaining” error. Should you have it on its own partition and it’s now filled up, then you probably have old kernels there and can use these steps to clean them out. Open a terminal either by holding down Ctrl, Alt and T or starting it from the Dash. You could also use the Whisker menu in Xubuntu while Lubuntu or LXLE users may wish to start an LXTerminal from the System Tools menu. Run uname -r at the command prompt to see which version you’re currently on. 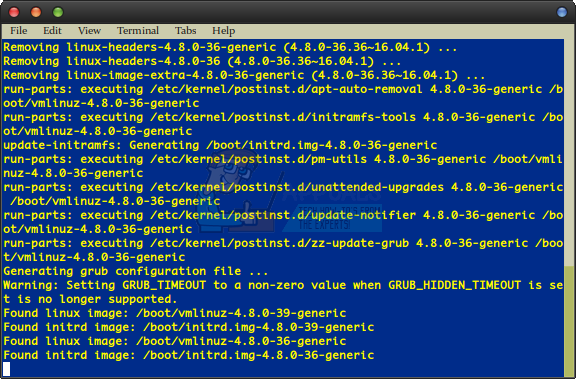 It should give you a name like “4.8.0-39-generic” or something else depending on which kernel is working for you. You’ll see this and other large dpkg commands in many Ubuntu guides and it can be difficult to type them all out, so you might want to highlight that with the mouse and either right click and select copy or push Ctrl and C at the same time to copy it to the clipboard. Back in your terminal window hold down Shift, Ctrl and V to paste the dpkg command in or click on the Edit menu and select Paste then push enter to get the list. Type in your password if it’s asked for and then push enter again. You’ll see a lot of text scroll up and then you can close all programs and reboot the machine, perhaps simply by typing reboot at the prompt and pushing enter. This cleans the /boot directory out easily in only three commands. Using the command line is by far the easiest way to solve this problem, since it takes an absolute bare minimum of three commands to get the job done, and this is a great time to practice if you’re command line shy. 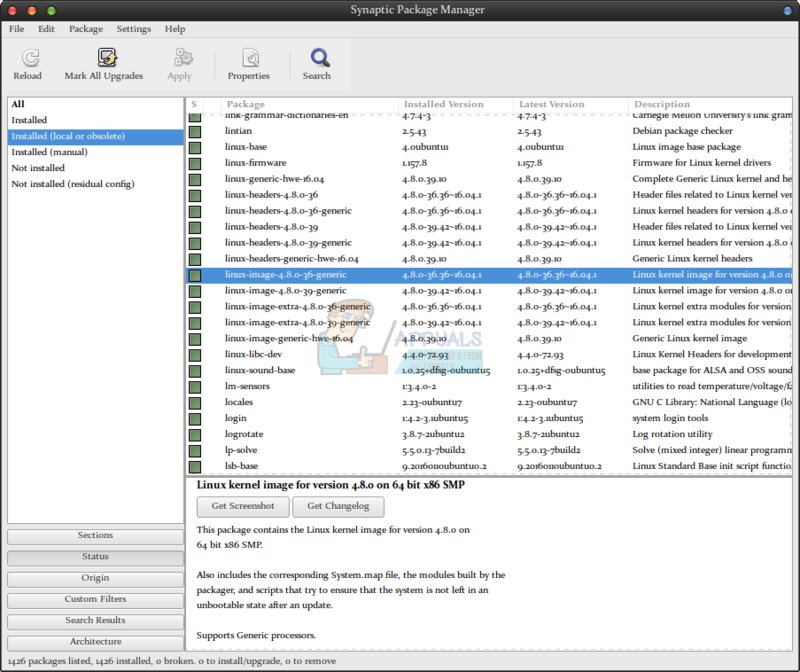 Nevertheless, you could do this with the graphical Synaptic Package Manager as well if you have it installed. If you don’t have the Synaptic package manager installed, then you can ironically open a command line and once you’re there you can then type sudo apt-get install synaptic followed by your password if prompted. You’ll still be able to install non-boot apps even if the /boot directory is full. Start the application whether you installed it or already had it installed. It should be located in the System area in the LXDE menu as well as the Whisker menu. You’ll be prompted for your password graphically. Click on the Status button underneath Sections and then select “Installed (local or obsolete)” underneath All. Start typing linux-image- and then you’ll see a number of packages with different numbers. Run uname -r from the command line like above and then check which of these packages doesn’t match that number. You should not remove the package matching the version number of the kernel this command returns. If you find antiquated packages, then you can right-click on them and select “Mark for Complete Removal” before you click on Apply. You’ll be prompted to review the packages you’re removing, so you’ll have an opportunity to check that you’re not accidentally removing your current kernel in the process.